S-26 GOLD TODDLER; supporting 4 key pillars of toddler nutrition with the Alula Toddler PlatinumCare ComplexTM. Our most advanced formulation in Australia. S-26 GOLD TODDLER; supporting 4 key pillars of toddler nutrition with the Alula Toddler PlatinumCare ComplexTM. S-26 GOLD TODDLER nutritious milk drink has been carefully formulated with reduced protein* in keeping with expert recommendations. Plus it contains omega 3 DHA, and an energy level comparable# to regular cow's milk. *S-26 GOLD TODDLER now contains 1.3g/100mL of protein compared to previous formulation of 2.5g/100mL. 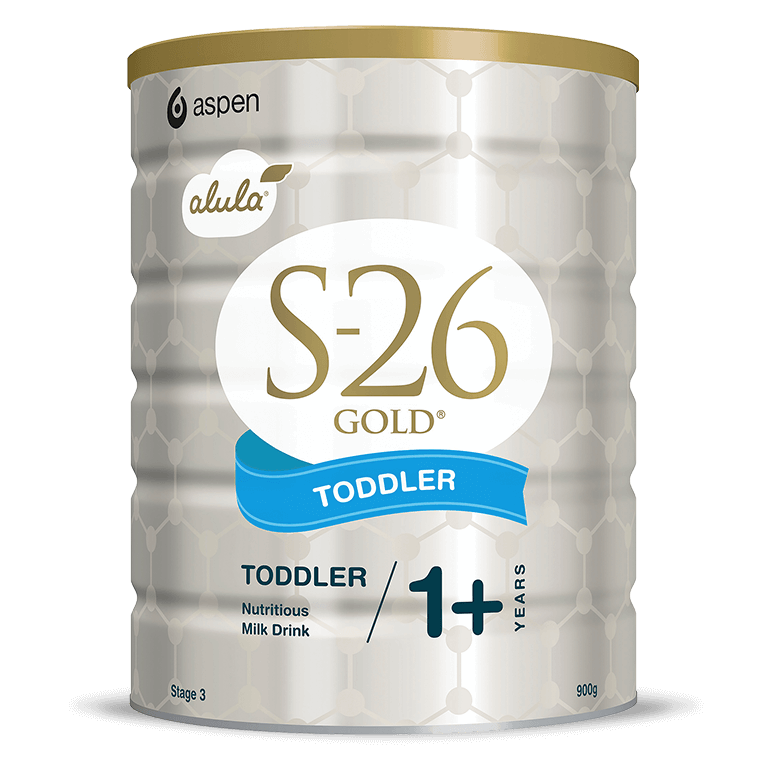 #S-26 GOLD TODDLER has an energy level (270kJ/100mL) comparable to regular cow's milk (avg. 277kJ/100mL). S-26 GOLD TODDLER milk drink has no added artificial colours or preservatives and does not contain sucrose. Pour 200mL of water into a cup or shaker and add 4 scoops of S-26 GOLD TODDLER powder. Shake or stir until dissolved. To make a yummy fruit smoothie, pour 200mL of water into a blender. Add 4 scoops of S-26 GOLD TODDLER powder plus your choice of fruit e.g. banana. Blend well and serve. Freeze to make fruity ice blocks. Replace regular cow’s milk with S-26 GOLD TODDLER when preparing cereals for breakfast, when baking treats or cooking meals for your toddler. *”Suggested Serves per Day” is provided as a guide when your toddler’s intake of energy and nutrients may not be adequate. Use only the enclosed scoop in the preparation of a drink. Discard any unfinished serves. B Vitamins including B6 and B12, which help contribute to normal energy metabolism, as well as B2 and B3, which help contribute to normal energy release from food. These assist when dietary intakes of energy and nutrients may be in adequate. Formulated supplementary food for young children 12 months and over.